In the WAY distant future, a spaceship leaves Earth and enters a wormhole, only to return centuries upon centuries later. Your spaceship crashes on Earth, which is now an ice and water covered planet. There are no humans around anymore, just water everywhere. 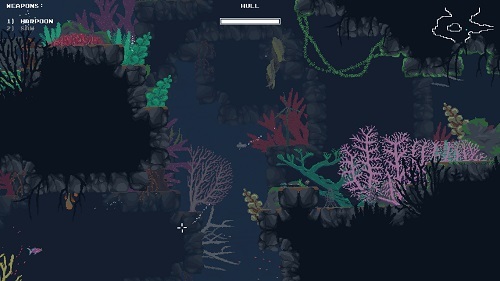 Luckily your spaceship can double as a submarine, so it’s up to you to explore this watery landscape, figure out what happened to all the humans, and just try to survive amongst the hostile sea creatures. This game with the ridiculously long title is a 2-D action adventure game with exploration elements similar to Metroid. It’s available to download on most current game consoles and PC, but reviewed on Switch here. The game reminds me of Metroid mixed with Ecco the Dolphin, because you spend the entirety of it underwater. The 8 and 16-bit pixel graphics also give the game a Cave Story feel to it, too. Use the left analog stick to move around, and explore the seascape to find upgrades for your ship. Such as extra health, faster hull regeneration (you don’t get health items in this game), as well as weapons and tools that’ll help you defeat enemies and progress through the areas and backtrack to reach new ones. Some of these include a harpoon, your main weapon, which you can aim below you in any direction with the right analog stick. Other tools include a saw for cutting through thick seaweed blocking your path, a lamp for lighting dark areas, and speed boosters. There are no minor enemies in this game (aside from land mines), just bosses. And hoo boy are those bosses hard! It doesn’t make it easier that you might have to fight a lot of the bosses in the dark, and that many of them can kill you in one or two hits. It really makes the game feel unbalanced. It’s also hard to see what’s in the background and foreground. Also the map system is pretty crappy, which isn’t good considering how much you’ll be backtracking. It’s a shame, too, because the graphics and sound really give this game an inviting and relaxing atmosphere. I just couldn’t get into the game because of the problems it has. The Aquatic Adventure of the Last Human is rated T for Teen with ESRB descriptors of Blood, Fantasy Violence, and Mild Language. If you hit a sea creature with a harpoon, they’ll explode into pixelly chunks and leave a cloud of red blood behind. Didn’t really notice any bad language, so it must be only used sparingly in the text. Reading skill is helpful for the text, and younger gamers may find it a bit too difficult. Sounds a *lot* like Song of the Deep, which I’ve started a few times but never seem to be able to finish. I guess “too many Metroidvanias to handle” is a good problem to have?